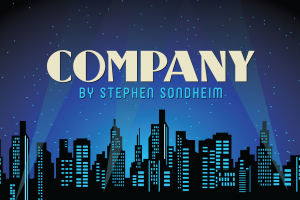 SHREVEPORT, LA — Centenary’s Marjorie Lyons Playhouse and the Singers’ Workshop at the College’s Hurley School of Music are teaming up to present Stephen Sondheim’s Company, the winner of seven Tony Awards including Best Musical, Best Score, Best Lyrics, and Best Book. Ticket information for the 7:30 p.m. performance on Saturday, April 6 and 2:30 p.m. matinee on Sunday, April 7 is available at centenary.edu/mlptickets. Company is regarded as a trailblazer of the dark comedy, modern musical genre, with an energetic score that includes many of Sondheim’s best-known songs, including “Ladies Who Lunch,” “Not Getting Married,” and “Being Alive.” The production features music and lyrics by Sondheim, a book by George Furth, and orchestrations by Jonathan Tunick. It was originally produced and directed on Broadway by Harold Prince in 1970 and has been revived several times, most recently in London in 2018. The musical follows confirmed bachelor Robert as his 35th birthday approaches, contemplating his unmarried state as he lives a whirlwind life of dates, dinners, drinks, and celebrations. Despite all the company, he is somehow always alone. Through a series of vignettes, Robert’s friends demonstrate the pros and cons of married life, and the commitment-phobic Robert is forced to confront his adamant attachment to bachelorhood during a hilarious array of interactions. Centenary’s production also features musical direction by Adam Philley, choreography by Laura Beeman Nugent, who also performs the role of Joanne, and set and lighting design by Don Hooper. Following open auditions in September 2018, Sadler assembled a cast of Centenary students and one faculty member, Dr. Ross Smith, who is playing the role of Larry. Sadler feels that Company is a perfect match for a school like Centenary, because the small cast includes featured roles for every actor. Tickets for Company at Marjorie Lyons Playhouse are $15 for general admission, $10 for military and seniors, and $5 for students with ID. Centenary students, faculty, and staff can reserve free tickets at centenary.edu/mlptickets. Company is presented through special arrangement with MTI International. All authorized performance materials are also supplied by MTI.